Supreme Court of India Today said that it is extremely unfortunate that the official website of the Ministry of External Affairs gives misleading information not only to Indians but also to the world at large. The observation came in the Judgment of Supreme Court which dismissed a Plea filed by Marie-Emmanuelle Verhoeven a French Woman challenging her Extradition to Chili for her alleged involvement in a conspiracy to kill Senator Jaime Guzman Errazuriz on April 1, 1991. The Bench comprising of Justices Madan Lokur and N.V.Ramana said that in this day and age when communication and communication technology are so important, the Ministry of External Affairs has to be far more careful in the information that it disseminates to the world at large. 132.Finally, learned counsel for the petitioner commented on the dissemination of information by the Ministry of External Affairs through its official website. It was pointed out that the official website informs everybody that India had entered an extradition treaty with Chile in 2015. Learned counsel relied on this information to contend that the Government of India does not recognize the Extradition Treaty of 1897 and there is no extradition treaty entered into with Chile in 2015. Consequently, the entire proceedings against the petitioner are vitiated. 133. 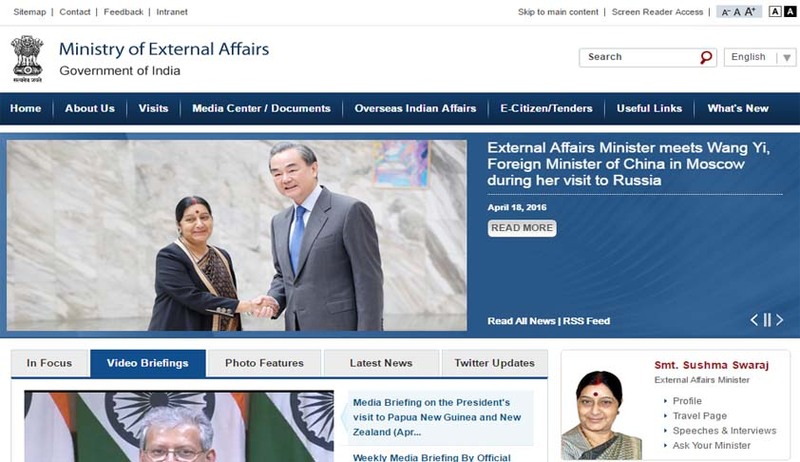 It is extremely unfortunate that the official website of the Ministry of External Affairs gives misleading information not only to Indians but also to the world at large. The learned Additional Solicitor General was quite upset at the misleading information given on the official website and informed us that he had given a piece of his mind to the concerned officials in the Ministry. Whether amends have been made by the Ministry of External Affairs and whether the advice given by the learned Additional Solicitor General has been taken by the Ministry of External Affairs in the right spirit or not does not concern us. All that we need say is that in this day and age when communication and communication technology are so important, the Ministry of External Affairs has to be far more careful in the information that it disseminates to the world at large. 134. We may also note the relaxed attitude of the Ministry of External Affairs as evidenced by the manner in which the notified order dated 28th April, 2015 was drafted by it. The text of the notified order leaves much to be desired. We have already pointed out three errors in the notified order, none of which should have occurred at all. The errors only show the laid-back manner in which the Ministry of External Affairs conducts its internal affairs. To make matters worse, the corrigendum gazetted on 11th August, 2015 fails to correct the error in the earlier notified order where the Extradition Act, 1962 is referred to as the Indian Extradition Act, 1962. It is time that the Ministry of External Affairs gets over the colonial hangover. Though the error is minor and not substantive, it should not have been there at all. We need say nothing more on this subject except to be optimistic and hope that the Ministry of External Affairs of the Government of India takes matters of law far more seriously than is evident from the material on record before us. 135.It is time to realize that India is now a significant and important player in the world stage. Very little attention appears to have been paid to affairs of international law as is evident from the manner in which the affidavits have been drafted and filed by the Government of India not only in the Delhi High Court but also in this Court. Most of the relevant material handed over to us in Court by the learned Additional Solicitor General did not form a part of any affidavit filed by the Government of India. True, there is no dispute about the authenticity of the material handed over to us in Court but that is not the issue. What is in issue is the nonchalant response of the Government of India on a matter concerning the liberty of an individual, even if that individual happens to be a foreign national who is in India.